All India SWM Toppers from 01.06.13 to 28.07.13 - Hulikal crosses 6000 mm in just 58 days...Published on 28thJuly on Pradeep's Page. 1. Axis shifts Northwards from Monday. Very Windy along Maharashtra coast and in Madhya Maharashtra. 2. Next 2/3 days, very heavy rainfall regions indicated (green), medium Heavy (Purple) and Moderate (Blue). 3.Southern Rajasthan/Adjoining Gujarat (Southern Udaipur District) gets heavy rains for a day. 4.West coast upto Surat, bit more active on Tuesday (40-50 mms at some stations). Mumbai gets chance to catch up on 2000 mms on Tuesday. Tuesday sees a slight increase over Monday, with 30-40 mms on Tuesday. Will it reach 2000 mms before 30th morning then ? Delhi NCR sees some heavy showers on Tuesday night. Nagpur gets moderate showers on Monday, and rains decrease thereafter. Karachi and Southern Sindh Cities have hopes of Thunder Showers till Monday . Nawabshah too, may hold on hopes till Monday. Karachi AP has received just 4.4 mms in July this year. Karachi Masroor has received 0 mms !Jue was just 1.1 mms at Karachi AP. Sukkur 4 mms and Hyderabad 1 mm. June was 0 mms. Highest in Sindh is Mirpur Khas with 24 mms. In fact, the SWM advance line is stuck, and advance is resisted by weak systems. Kathmandu has crossed its normal rains for July. With 401 mms (Normal 363 mms). City has got well distributed rains this month. As the month closes, we see some more rain early next week, with some sharp showers on Tuesday and Wednesday (>25 mms). The axis position is gong to be favourable, as has been this month. no more rain in july, in sambalpur. Today light rain for one & half hour in afternoon. IMD says probably negative IOD during later phase of monsoon - wondering this will have bad impact on NEM monsoon? What to expect in august for konkan, north gujarat and cherrapunji.. I see cherrapunji and north east are not getting that good rainfall. again light rain from afternoon and still continuing, in sambalpur. I am a little doubtful of the total rainfall figure for Kathmandu for July; esp the figure of 109 mm on 25 July - but it is the official figure, we have to go by it. Those adventurous can venture to Nariman Point today - winds high enough to lift you along with umbrella !! Maharashtra,MP,Orissa,Guj have performed extremely well. Last few weeks GUJ stole the show, even Kutch,Surashthra are in vigorous phase. With Rajesh Sir forecast still in place... Ahemdabad has done extremely well till june it was in extreme negative phase but last few weeks it has recorded 600mm of rain... and 2 months it go it may touch 1000mm, as of now Ahmedabad is still 3 time BANG rain (still struggling with 250mm) and 4 time MYS rain. Monsoon is weak in south for last few days - today no rain even in coastal area. Rains still elude interior of south (AUG/SEPT axis will move north which is of great concern)..
All forecasts say MAHA is for another dump as low over BAY has moved in ...any news? 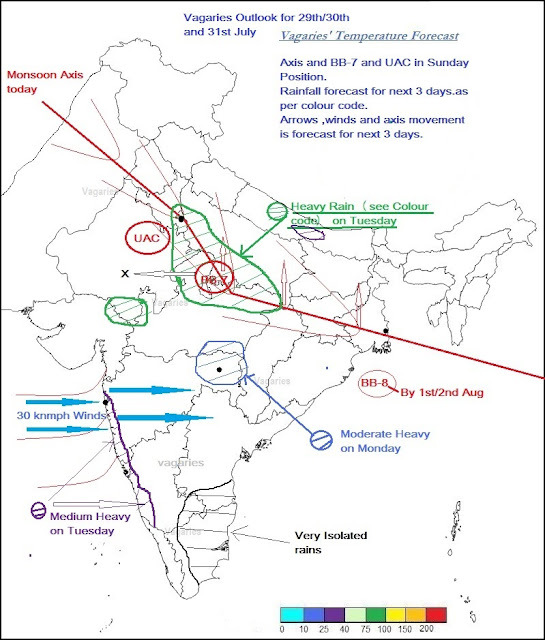 IMD maintains deep RED alert over Vidarbha tomorrow that means rains 400mm-500mm in 24hrs! Mumbai orange alert for 2 days! 2013 monsoon pattern is just like "PARABOLA SYMMETRIC OVER Y-AXIS"
Just wondering why can't few BAY depressions cross south India...to bring rains in interiors..
sset: IOD effect on NEm...still too early to discuss. And, I personally do not take the IOD parameter too seriously. Vinod: August also seems like good rainfall. BB-8, and another follows, with good rainfall after 7th/8th August in Central India . Neeraj:Mostly, the amount of 109 mms seems difficult to digest. Check the rain amounts around too. anyway, Kathmandu recieved 33 mms on Tuesday as we had expected >25 mms..